The Middle Stump: Wot no Jimmy? James Anderson's a doubt for the First Test at Durban which starts on Boxing Day which could well be series defining. News came through last night which will put a smile on the South African top order more than when David Cameron is served pigs with blankets with his Christmas dinner. Whether this is a smokescreen from the English management is to be seen, but the hearts of English men and women sank with the news, in a similar way to my kids when they unwrap a lump of coal in a couple of days time. So who will replace him? Most of us presumed that the four seamers would be Anderson, Broad, Stokes and Finn. The first three are more or less guaranteed their place and the fourth spot was a shoot out between Finn, Woakes, Footitt and Jordan. We ran a poll on Twitter a few days ago and like Ighalo with the Liverpool defence last weekend, it was the Watford man who overwhelmed the poll with 72% of you voting for him. Four wickets in the warm up game no doubt helped. With Anderson's news though, that would leave a space for one of the other three. Chris Woakes is the man most likely to get the nod. Woakes has been in fine form in white ball cricket, and although not in the same class as Jimmy the Warwickshire man nibbles the ball both ways off the seam. Woakes can bat, is a fine fielder and offers us the most like for like swap. Footitt offers something different. Left arm over would no doubt help Moeen Ali as he would naturally churn up the Kingsmead track on a pitch likely to last the full five days. Durban with a tropical climate tends to aid the seam bowlers more, and with the stadium a David Gower underarm stone's throw from the sea the urban myth is that the tide plays a part here too. Footitt is raw and has genuine pace, but isn't really a Jimmy replacement. Jordan meanwhile picked up just 3% of the vote. For me though, there are two bowlers in England who are most like Jimmy with regards to their type of bowling. In fact, one of them even shares his Christian name but neither are out in South Africa at present. They will be drinking Bourbon instead of being in Durban, with their feet up and watching Bob Anderson instead of replacing James Anderson. Jack Brooks and James Harris are the two concerned and both rely on swing. Both are attacking bowlers who keep the ball up to the bat, and take their wickets in clusters like all good strike bowlers should. Both rely on moving the ball as opposed to express pace, but neither are slouches when it comes to the speed gun. The majority of their wickets tend to be snaffled in the cordon and I'm not talking about the fat bloke off Gavin and Stacey. Both tease the batsmen to be driven through the covers before some late movement takes the edge or traps the batsmen in front. Adopted Yorkshireman Brooks has picked up close to 150 wickets in the last two years as he has led his county to back to back titles and wouldn't let anyone down. He also has experience of South African conditions having been based at Potchefstroom on the England Performance Programme in recent years. 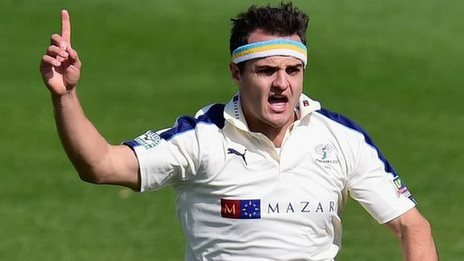 The Headband Warrior will run in all day but most importantly he gets wickets. Personally I would love to see him get the gig, and can you imagine the faces of the Afrikaan community as he ran around the ground doing his aeroplane celebration? Harris was a childhood prodigy at Glamorgan and moved to Middlesex a couple of years ago. Some tough times ensued but he bounced back to form with 69 Championship wickets last year as Middlesex took runners up spot. With a bit of help in the track he can be lethal, as his 9-34 against Durham last year proved. Harris is no mug with the bat either. The prospects of either of these two playing are similar to a turkey hitting the Boxing Day sales, or those concerning the long term employment of a Manchester City or United football manager currently. With the current England selectors they have no hope of seeing the Cape of Good Hope but for me, they are the two most like for like bowlers to James Anderson. How England cope with their fast bowlers is key here in a series that could be tighter than Phil Tufnell before payday. 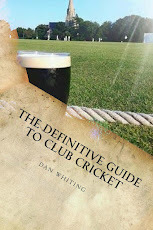 If Durban does last five days as expected, Jimmy and the quicks will just have enough time to churn out a verse of "Auld Lancy Syne" before the Cape Town Test starts and the tough grounds of South Africa can be a harsh environment for sportsmen even if these stadia aren't at altitude like Jo'burg or Centurion. Time will tell and we shall see if Anderson makes the Boxing Day test. If England get the green light on Jimmy's calf, it could be time to get out the fatted calf.